I re-made the vogue top again today, and even though my husband likes it, I'm not too sure. I still have to put the hem in it, so I haven't modeled it for the camera yet. Maybe tomorrow. Or the next day! I hate it when things don't turn out like planned. I tend to lose interest in them, and push them to the bottom of the pile. Oh well. It will get done. Eventually! The weather was fabulous today, so I spent some time outside with my girls. 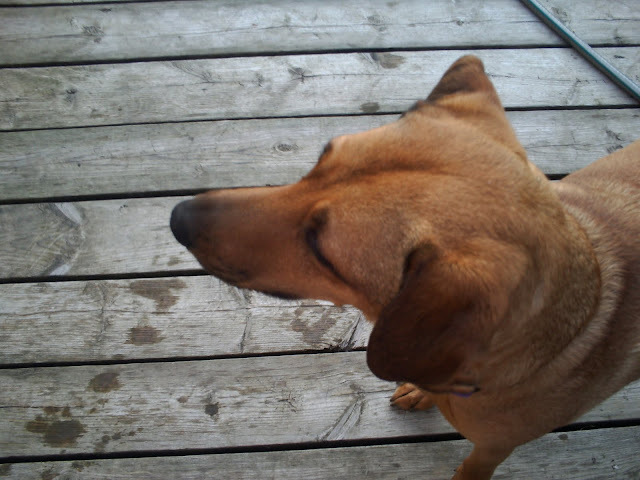 and Abbigale, who is a bit camera shy. 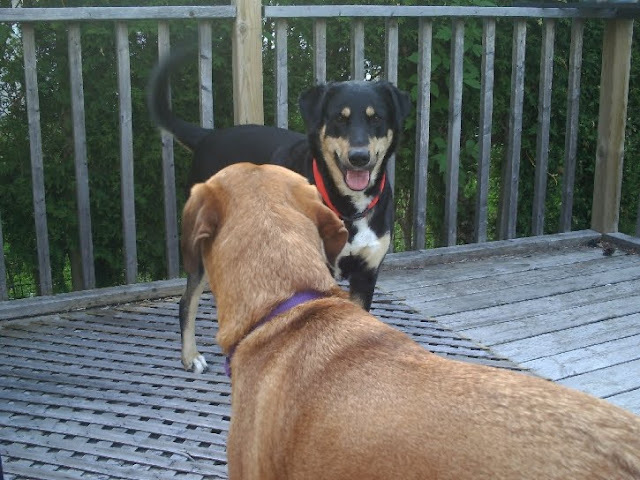 They had a great time romping around the yard, pouncing on each other. My girls are always with me, especially Abby, who never leaves my side! This is the best face shot of Abby I could get, just before she took off after Mercedes! They help fill my days with love and laughter, and ask only for love in return! 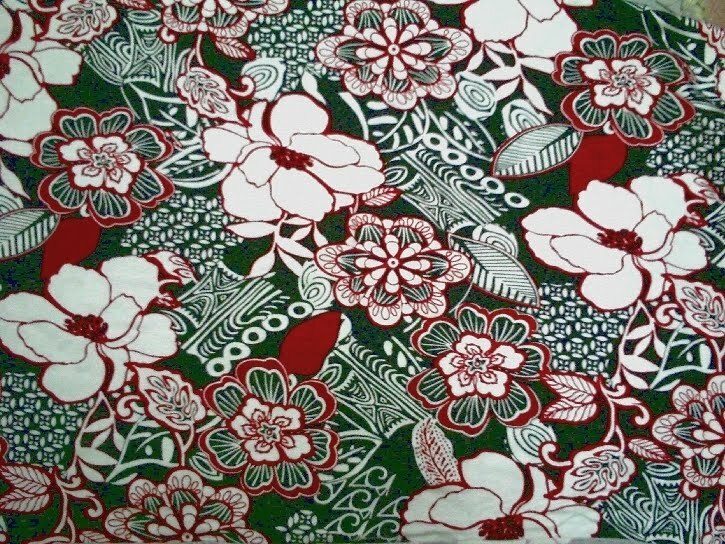 The short sleeve version, in this fabric. A nice soft, silky jersey. And as you can see, I'm not modeling it! It turned out humongous! I went by the measurements on the envelope, and ended up with a top large enough to get my family into! Tomorrow I'll pull it apart and make it smaller. So hopefully, tomorrow or Saturday I'll have a pic of the finished top. 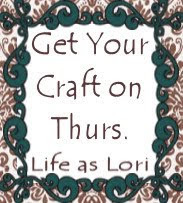 I have a few other items to make for May, and I'll post pic's when I have them done. Have a good night! I have to admit, thinking up a title every post is a bit of a chore. I know, I know, how hard can it be? One of my problems is that I can never be sure exactly what I'm going to post about when I start. I usually have a general idea, but, as usual I tend to veer off in a dozen directions. So I can start off talking about my sewing project, and end up talking about the life cycle of the polar bear or something. I can't help it! It's just the way my mind works! (when it's working!) Which reminds me. 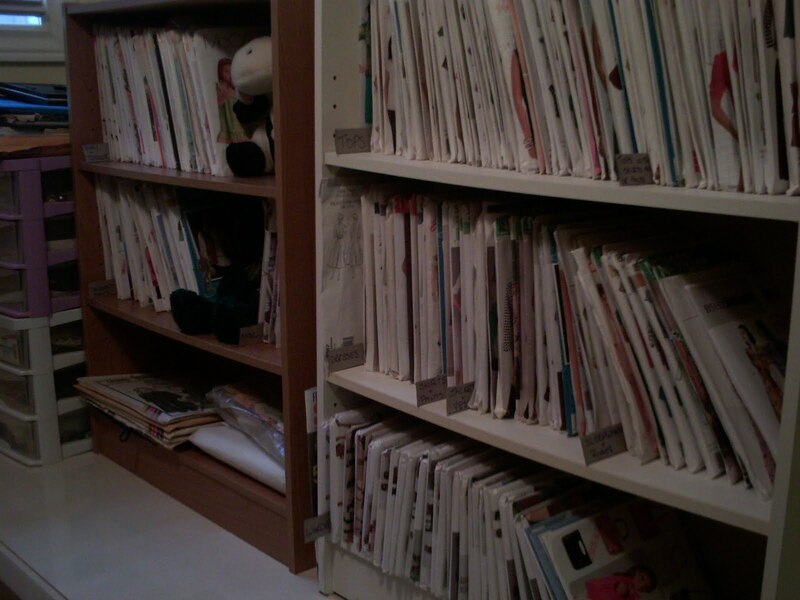 Yesterday I bought a bag full of retro patterns, really cheap. I was thrilled, and couldn't wait to get home and sort through my treasure. I gleefully dumped the bag out on my bed, and instantly started making a list in my mind about what I would make and when. Then I noticed the sizes. They range from size 8 -14. Now if this was a few years ago, that would have been great! I could have made everyone of them. But, there's no way I can squeeze my size 18 body into any of those patterns. I could have cried in frustration. Obviously when I asked the size 0 girl who sold them to me if they were large or extra large sizes, I shouldn't have believed her. And obviously looked for myself! But I was in a hurry to get home to meet my son. Of course she thought they were extra large patterns! What self-respecting size 0 wouldn't? 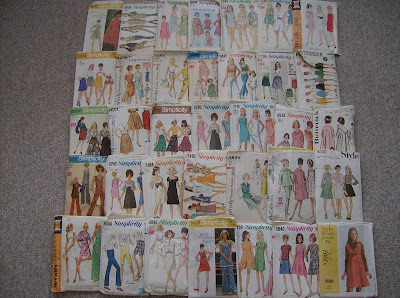 Sooo I ended up with 32 vintage patterns that don't fit. Lucky me. Today I refashioned two tops. They were both way to big for me. I thought I would make myself feel better by making something smaller for myself. Guess what? It worked! I know it's all in my head, I'm not any closer to fitting into those patterns than I was yesterday, but hey, something was too BIG! So today I'm a happy camper. 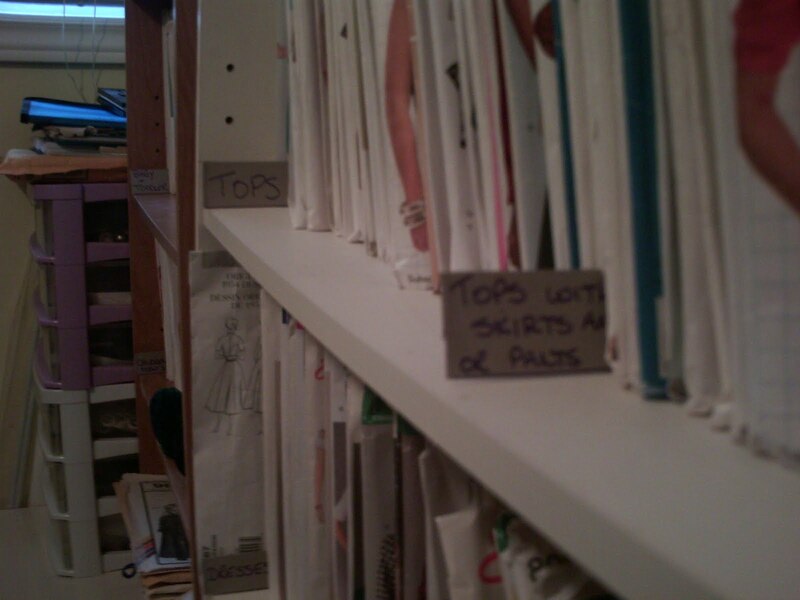 I don't have any pics of the tops, mostly because they are black, and I just couldn't get any detail to show up in the pics. I have been debating about setting up an etsy shop. I'm kind of leary about it though. I'm not all that sure how to go about it. I have read most of the instructions on the site, and the one thing I'm not really clear about is the shipping costs. How am I supposed to figure out shipping costs before I even sell anything? Maybe I'm missing something, or just not processing the info correctly, but I can't figure that out. Is there anybody out there that can help me? (and not laugh while they are doing so?) I would greatly appreciate it! Well, everyone is arriving home from work, and I can hear vague pitiful cry's of hunger. I guess I had better go whip up one of those creative meals I mentioned in my last post. Apparently it's feeding time at the zoo! Ah, the innocence of youth! To bad I can't convince him of things that easily now! 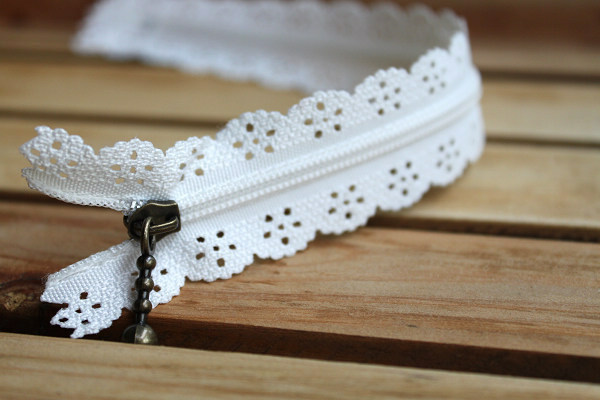 Japanese lace zippers! They are beautiful, and I'd love to have some in all different colours. To look at. Because honestly, I wouldn't know what to do with them. They would have to be sewn on as exposed zippers, and I think the stitching line would ruin the overall effect. Surprisingly the ones I found for sale on the net are only about $4 each. Yes, that's a bit dear, but not as much as I expected. They would be very pretty on little girl dresses, don't you think? Today was one of those days. 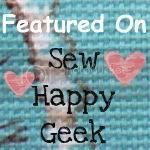 You know, when you are ready to start a new sewing project, but you have so many great ideas you don't know what to do first? I seem to do that quite alot. I'd like to make more summer clothing for myself,(specifically for me-made-may) but I just couldn't settle on any one thing. 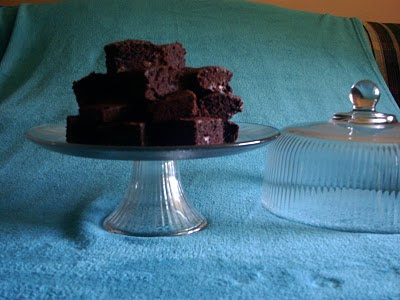 I procrastinated for a while, made some brownies, did MORE laundry and just generally puttered around. I decided that since I couldn't decide on a project for myself, I'd make something for my friend's granddaughter. A few weeks ago C and I went to goodwill. I picked up this pillowcase. It was brand new, never used. 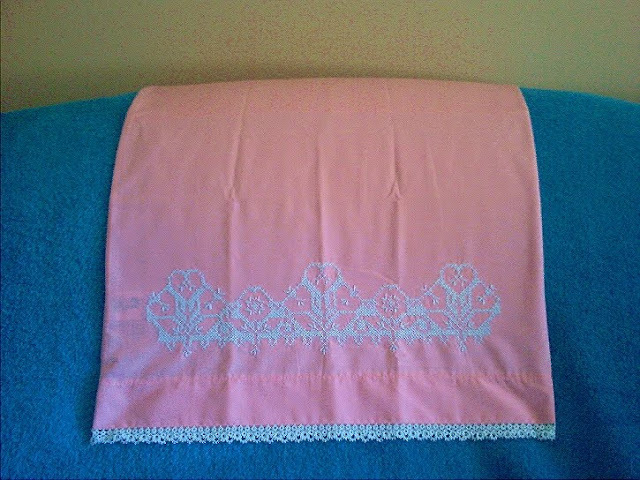 It was embroidered on the front in crosstitch, and hand tatting all the way around the bottom. It amazes me sometimes what people will 'throw away'. It must have taken hours for someone to sit and embroider and tat. It really is pretty, and I only paid 99 cents for it! I didn't use a pattern, I just measured down about eight inches from the top seam and cut. Then I folded it in half lengthwise and cut armholes. I used bias tape around the armholes and across the tops to make a casing. For the ties, I used five lengths of 3mm ribbon each for the front and back. I hand stitched a couple of stitches in the center front and back to hold the ribbons in place, so they can't be pulled out. Then I threaded clear beads on the ends of the ribbons and tied in a bow. It was too dark to take any pics outside tonight, so my pics aren't all that great, but it turned out really cute! This evening after dinner I spoke to my grandmother for nearly an hour. She lives in Saskatchewan, and I don't get to see her very often. She usually comes to stay with us for 4-6 weeks in Sept-Oct every year. Nan is the most amazing person I have ever known. Nothing seems to keep her still for long. She is always busy doing something. Knitting, embroidery, sewing, she does it all. 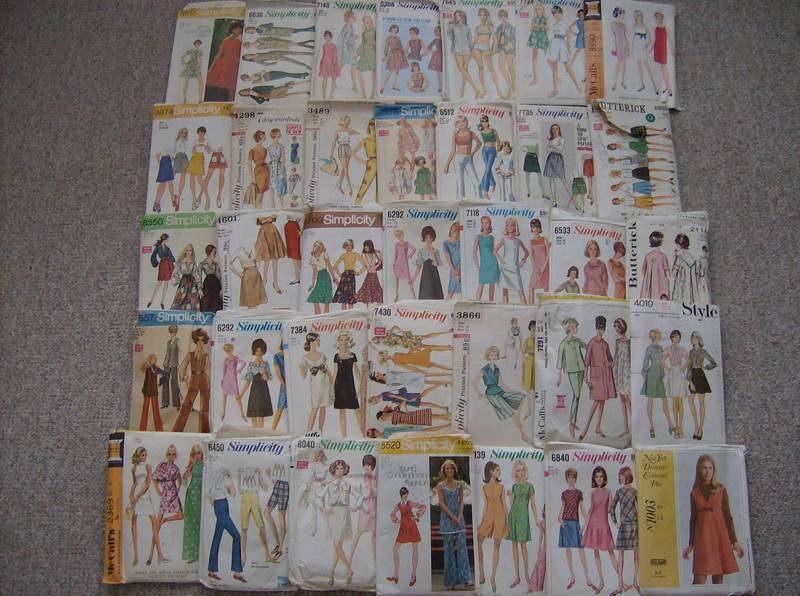 She told me tonight that she went to fabricland today to buy fabric for two new blouses, and ended up buying two dress patterns as well! She doesn't drive, never has, and either walks everywhere or takes the bus. This past January, she fell after getting off the bus, and broke her arm. Thankfully after many weeks, it has completely healed. But that was the only time in her life she couldn't knit or sew! She nearly went out of her mind with boredom! My granddad passed away twenty-two years ago, six months before my mom. Nan had both of them at home, and nursed them both tirelessly till their deaths. I don't know how she did it. Taking care of both of them, only to lose both husband and daughter within six months. In March of 2009, she called me, to tell me she was going on a trip. TO AUSTRALIA!! Wow, my globe trotting gramma! She was born there, but hadn't been back for about five years. We still have relatives there, and she went to stay with them for a month. This year, instead of nan coming to stay with us in Sept., I am going to stay with her. You see it's for a VERY special occasion. You see, on Sept. 11th, my nan, will be NINETY YEARS OLD!!!! boy, do I feel humbled. I love you nan!! So, today I had the brilliant idea to clean my youngest son's bedroom. I had been toying with the idea for a few days, and today I took the plunge. Literally. I practically had to tie a rope around my waist and tie it to the door knob to find my way out again. After donning rubber gloves and gas mask, I jumped in. And stopped dead in my tracks. Where to begin? How can one sixteen year old boy have so much stuff? I eventually started with the giant pile of clothing covering the floor. Naturally it all had to be washed, clean or not. With two large dogs in the house, the fur is everywhere. Not only that, but because my little darling loves to work on anything with a motor, it's hard to tell what is dirty or just stained with grease and oil. Then, SCORE!!! 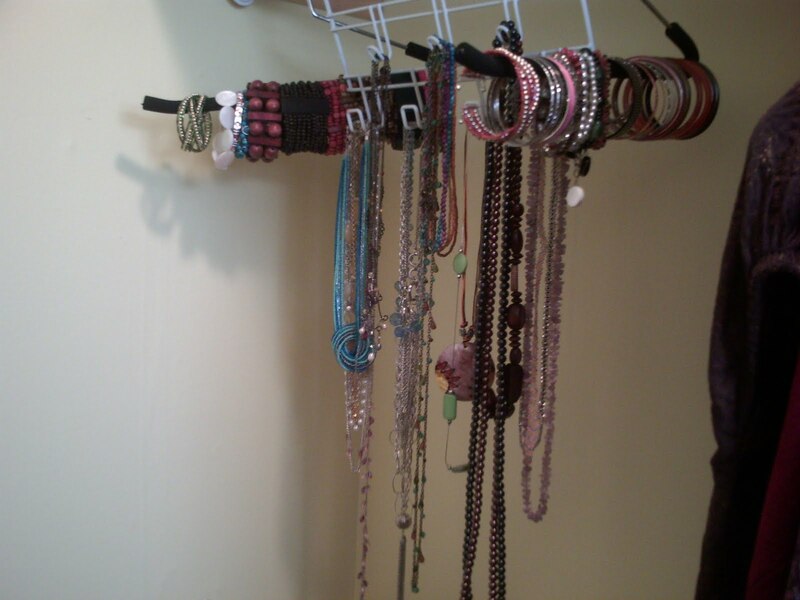 Mixed in with everything else, was a pile of sweaters and shirts just BEGGING to be refashioned! They were items that my son had brought home from his cousin, most of which was too small, or just not his style. I quickly pushed them all into a lrg green garbage bag and hid it in the basement. I had to hide it, because in typical kid fashion he would have complained, "but they are mine!" regardless if he would wear them or not. Two bags of recycling and a lrg garbage bag of trash later, I was finished. (did I mention TODAY was garbage day? I should have done this yesterday. Now I have to hide everything for a week so he doesn't reclaim anything!). I finished a few minutes before he got home from school. He looked in his room and then turned to me. "Did you throw anything out? ", with a sign of grief etched on his face. With my best poker face I looked back at him and said "No dear." and smiled inside as I pushed the trash bag behind me. 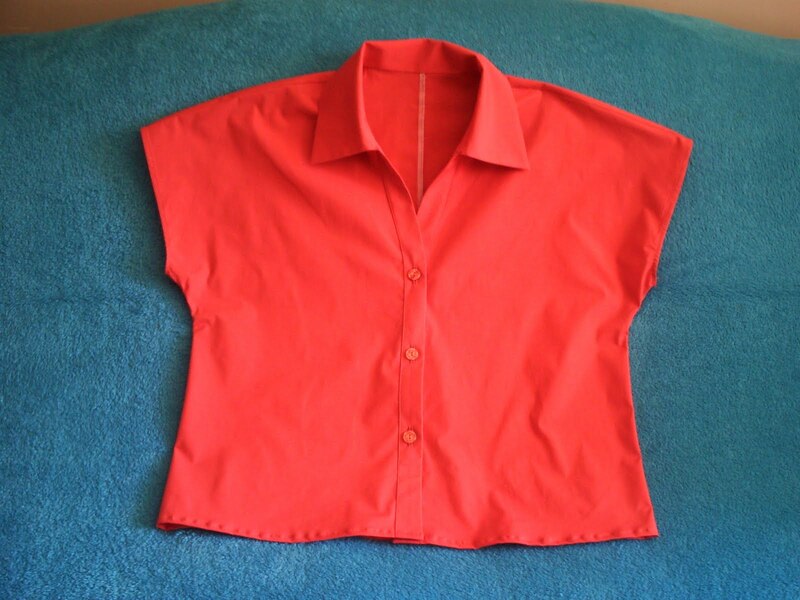 On another note, I did manage to sew the buttons on the blouse I made the other day. I procrastinate when it comes to buttons. I absolutely HATE sewing on buttons. So many times I have finished a garment and left it for a week or two, just because I'm avoiding buttons! I love this blouse. The colour is closer to coral than orange and will be great for the summer. It is a poly-cotton with lycra so it is comfy. The only complaint I have with the fabric is that it is a little stiff. I'm hoping that after a few more washings it will soften up some. 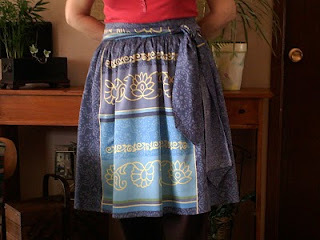 I also made this skirt in the past couple days. 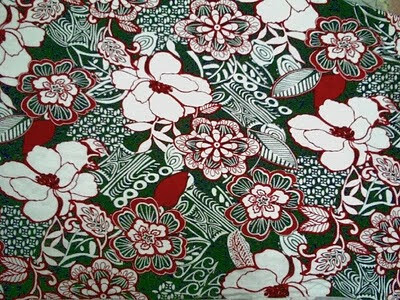 It is made from recycled curtain fabric. I love the print and the colours. 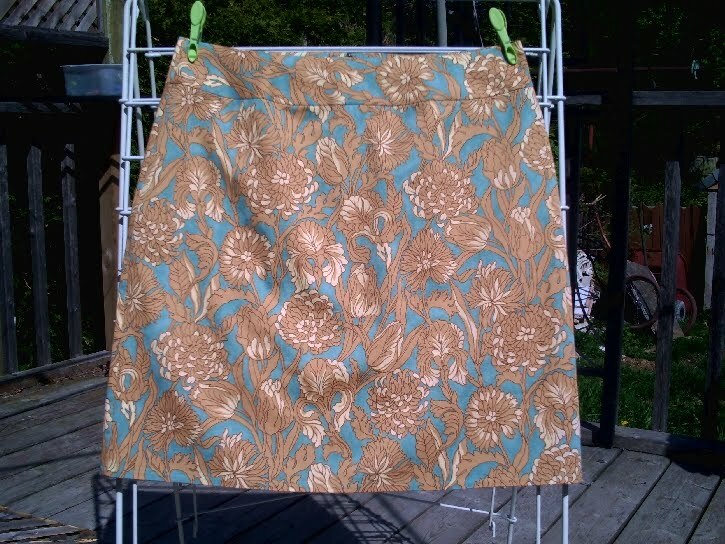 The fabric is the perfect weight for a skirt. be making them both again. They are very quick and easy to make and fit very well. Also, thank you to bagqueen for commenting on my last post! I was starting to feel very alone out in the blog world. I really thought no one was listening (reading?!). Until next time, Have a happy day! Today is my baby's birthday. At 3:48 on a cold Sunday afternoon, after 72 hours of labour, my 6lb 3oz daughter arrived, over 2 weeks early. My pregnancy had been difficult, every month seemed to bring a new problem. At five months I was told that my baby was likely to mentally retarded, due to my exposure to German Measles. Several tests were done, resulting in inconclusive results. I was advised by my doctor's to abort, but I was determined to have my baby. As the months passed, other complications arose. At seven months, my baby stopped growing, and for the first time a cesarean delivery was discussed. A few weeks passed, and my baby put on weight. At nearly eight months it was discovered that my water was leaking. Two weeks later. my labour started. My labour was intense and scary, my baby and I seemed to be hooked up to every machine and monitor in the hospital. There was talk of a C-section, because I wasn't dilating, and my baby's heartbeat was weak, and had actually stopped three times during the labour. As the decision was made to perform the C-section, I suddenly felt the need to push. I was fully dilated! Twenty minutes later my daughter was born. The nurses whisked her away as soon as she was born. One of them turned back as she rushed out the door with my baby, and yelled, 'It's a girl!' I lay there stunned, wondering how my baby was. Ten minutes later, they brought her back to us, beautiful, and PERFECTLY HEALTHY! Words cannot convey the relief I felt. Today my baby turned twenty-four. She is perfect in every way, and I thank God every day for that. 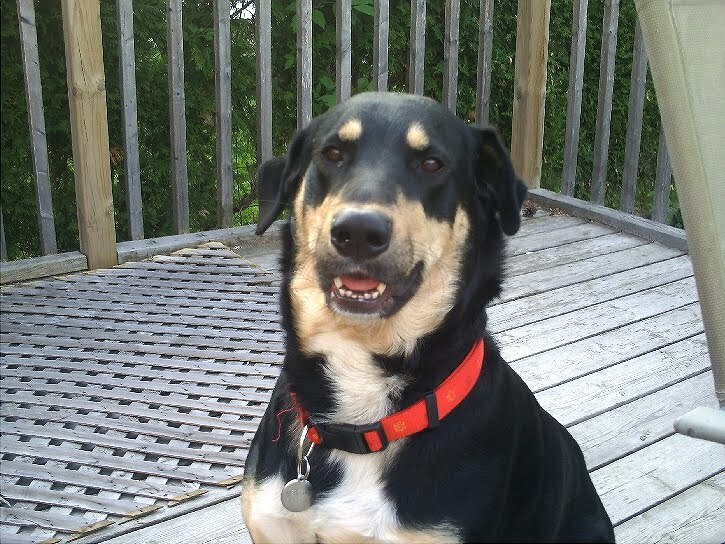 Today she is a university graduate, studying veterinary medicine. My Baby. While doing my daily surfing exercises yesterday (hey come on, my fingers get quite a workout! 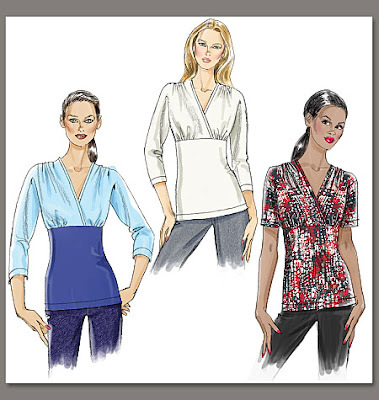 ), I came across 'So Zoe', another one of my now favorite sewing related blogs. For the month of March, Zoe pledged to wear only items she had made herself. (except bras,socks, tights and shoes) Now, she has proposed 'Me-Made-May' in which she is inviting everyone to join her! I have signed up for the 'light' version, which means I have pledged to wear at least one me-made item everyday throughout May. I do have quite a few 'me-made' items in my wardrobe, but the majority of them are for the fall/winter season. I guess that means I have to fire up the old sewing machine! Gee, that'll be quite the hardship. 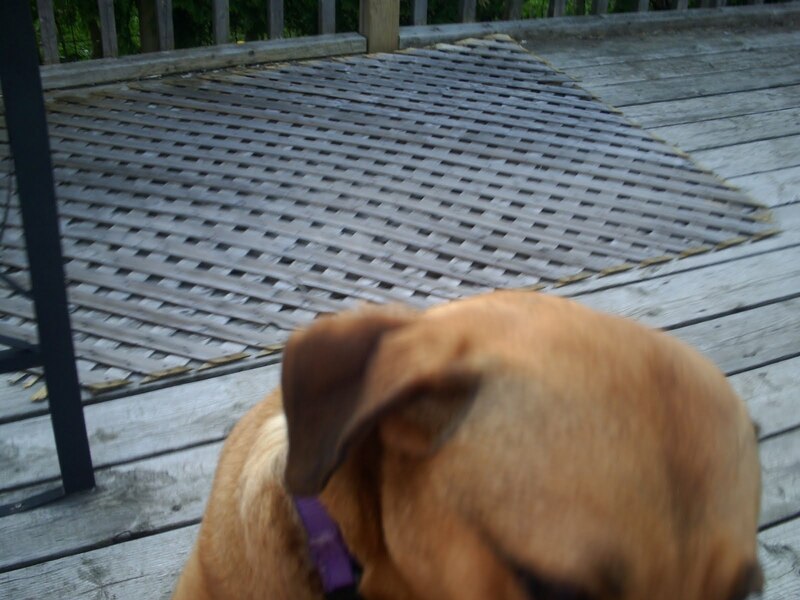 Another 'current project' she has running, is 'Stash-Bustin', and has suggested we join her in that endeavor as well. Since I had already sort of decided to do it anyway, I agreed to that too. (aargh, that Fabricland gift certificate is coming back to haunt me!!) Maybe (hopefully) I can make a dent in my stash for my spring/summer wardrobe. I did manage to make this yesterday. I wanted a light cardigan for the summer, and I found this pale aqua knit in my stash. It is very fine, and is to light weight to make a regular top out of. But it is perfect for this. I also had the sequin ribbon in my stash, and it is a perfect match. I'm pretty happy with it. Today I worked on a short sleeved blouse, and tomorrow I'll finish the hems and button holes. This week has just flown by! I've done some sewing projects for myself, but I will post about them later. Today I want to show you my latest creations for my little nieces! 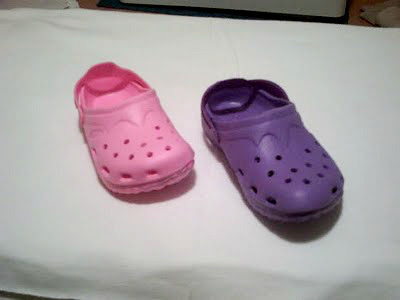 I saw these little shoes in the dollar store, and picked them up a pair each. They are cute, but kind of boring. I thought the pink and purple were perfect for summer. You will also need a darning needle, with an eye large enough for the ribbon to pass through, but not too thick to go through the button holes. 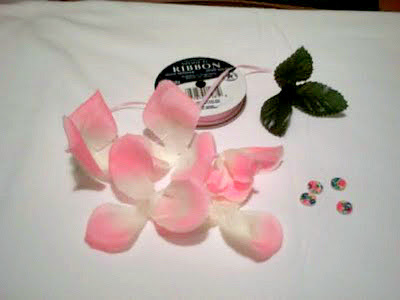 First, separate the flower petals and leaves, removing the plastic pieces that separate them. Gather the leaves and petals together again, with the button on top. 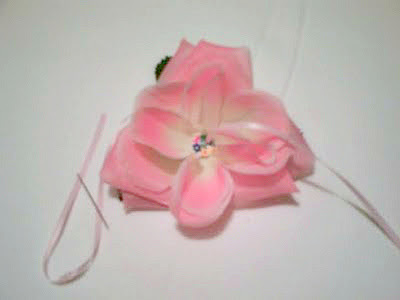 Pass the needle through the first button hole and down through the petals and leaves. Then, pass the needle through one of the holes on the top of the shoe. 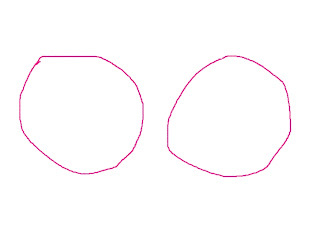 (There should be two holes almost in the center, side by side.) Then push the needle back up through the second hole, and back through the flower and second button hole. 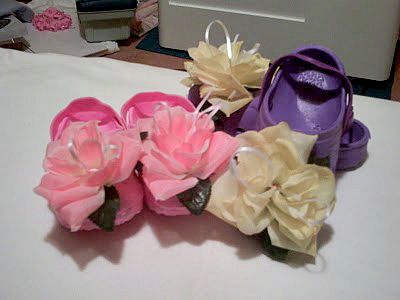 Center the flower on the shoe, making sure that both ends of the ribbon are the same length. Pull the ribbon tight and tie in a double knot. Tie into a bow, then into another knot. Fluff up your flowers and you are done! Sift together dry ingredients, then add chippits. Add wet ingredients and mix well. Pour into greased or lined square baking pan. Bake at 325 for approx 30 min. My oven cooks quickly and doesn't always take 30 min, so start checking at 25 min. 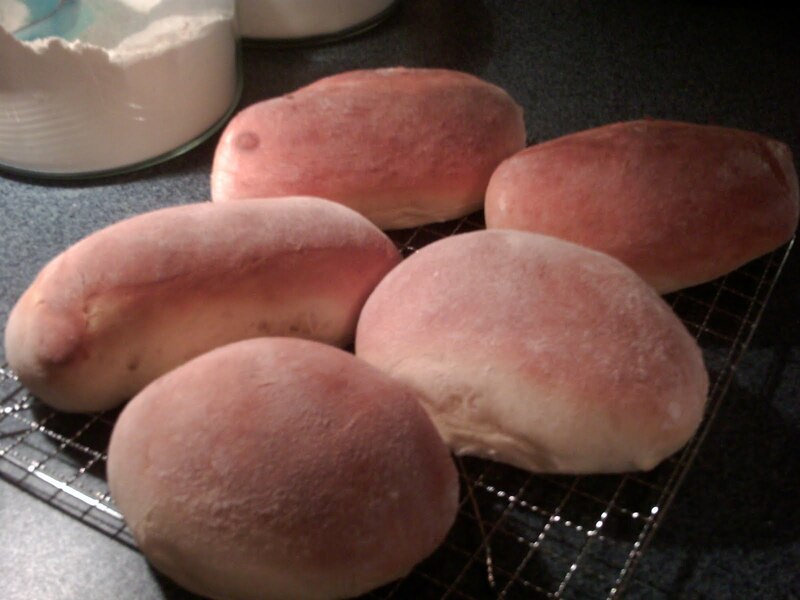 Cool on baking rack then enjoy! They keep well in a plastic container for 3-4 days. If they last that long! I also make these every Sunday for the week. My boys love them for sub sandwiches. I mix the dough in my breadmaker and then let them rise on cookie sheets before baking. You can find the recipe here. They come up light and fluffy every time. 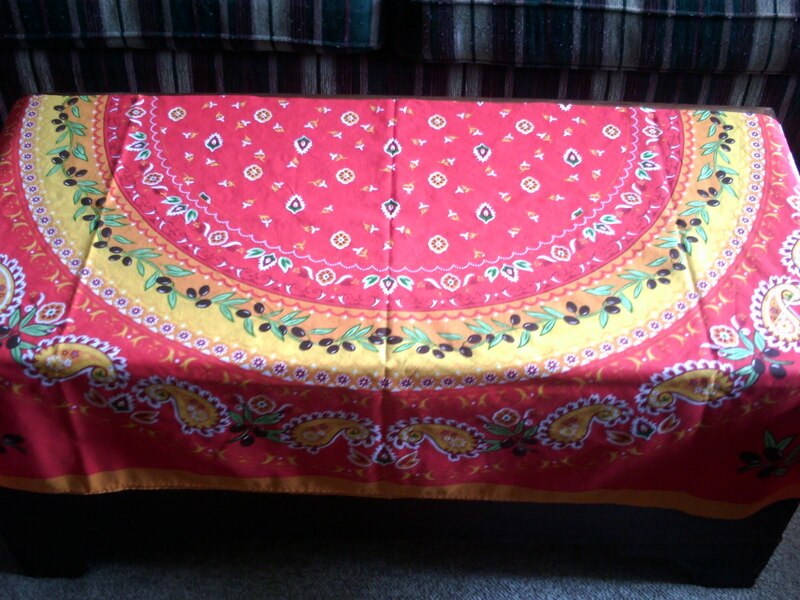 I bought this tablecloth a few weeks ago, only to discover that it was too small for my table. 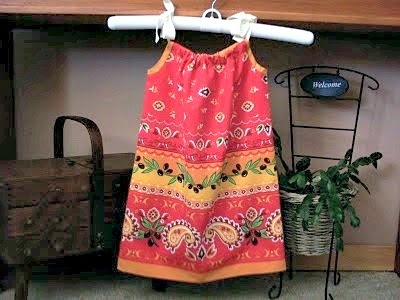 The colours are so bright and cheerful, that I just had to make my BF's little grandaughter a summer dress. She is such a little sweetheart, and loves pretty dresses. 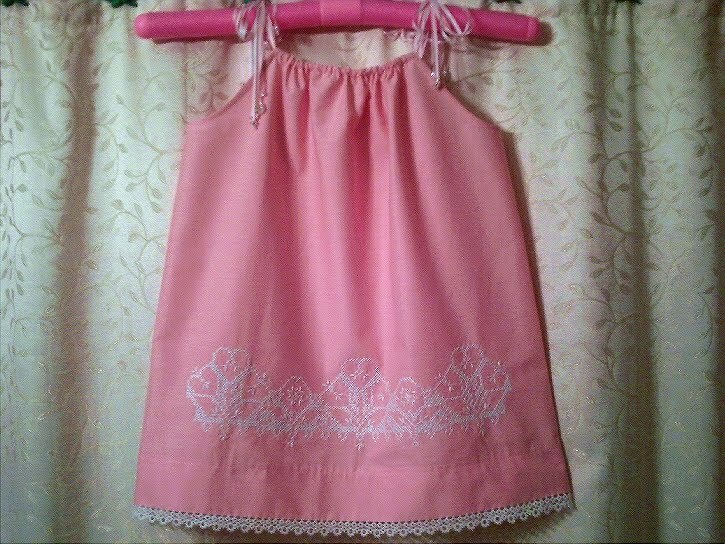 There is plenty left, so I might make matching bloomers! I was also able to make up the blk/white cardigan yesterday, but haven't taken a pic. I was too busy with the dress! 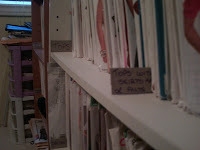 I've thought alot about the changes taking place at Wardrobe Refashion and decided to be a bit pro-active. I started a blog today for anyone who is interested, to add thier blog to a sort of 'central directory'. I won't go into detail here, but you can check it out here, at Refashionistas Unite! I hope that we have a quite few people visit and list their blogs. Fingers crossed! I had every intention of making up the blk/white cardi today, but got side tracked. It started out as another fibro day, so I didn't do much for a good part of the day. 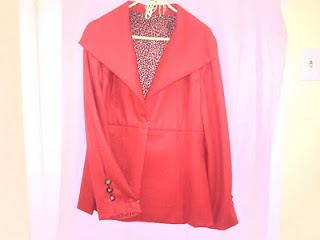 Finally this afternoon I gathered some energy to do some hand sewing on this jacket that I started a few weeks ago. I wanted it for early spring, but I seem to have missed the boat! Unless we get some more cool weather, I won't be wearing it until October. Oh well, I love it anyway. 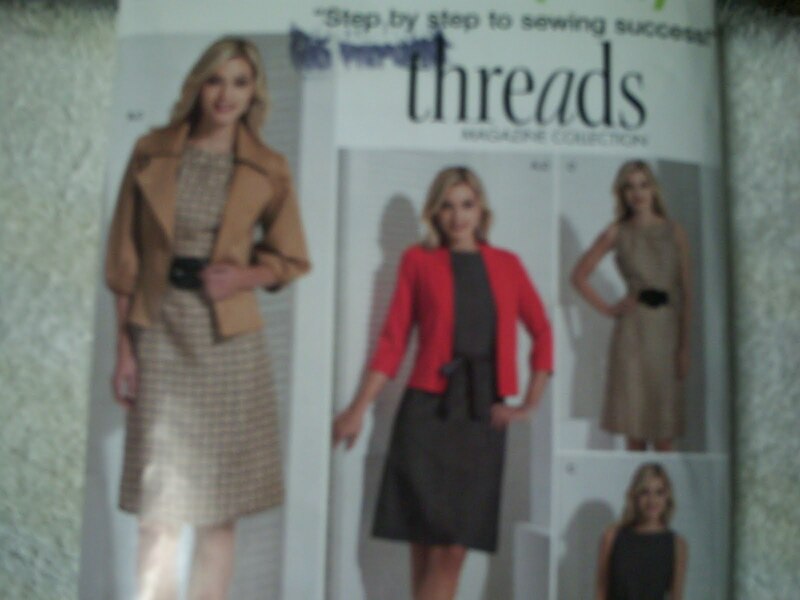 It is another Simplicity pattern # 2812. You can see it here. I bought the fabric at Fabricland last fall, and had been debating ever since what pattern to use. 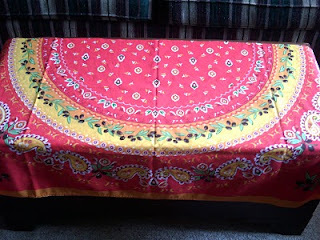 The lining is cut from a thrifted ladies blouse. I love the leopard print against the spicey orange. 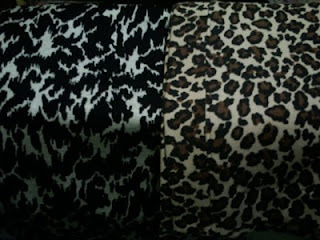 But then again, I LOVE animal prints, especially the big cats! The sleeves are pleated at the cuff, but I took the seam up about 3 inches more than recommended, and added buttons for interest. When I get some more thread (I ran out) I'll do the front button holes and sew on the matching buttons. 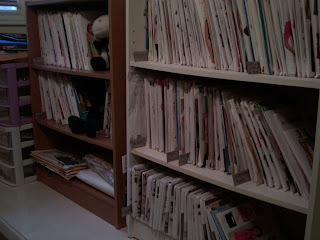 After searching for the pattern amongst everything else in my closet, I decided to sort them according to what is in the pattern. This is the result of my hard work. It has taken me a few days to get back, but here I am. I had quite the fibro flare up, so was pretty much useless to anyone! I'm feeling better now, and I'm anxious to start sewing again! I generally try to sew a bit everyday, but sometimes it's just not possible. As I mentioned in my last post, I joined wardrobe refashion for two months. Here is a copy of my pledge. 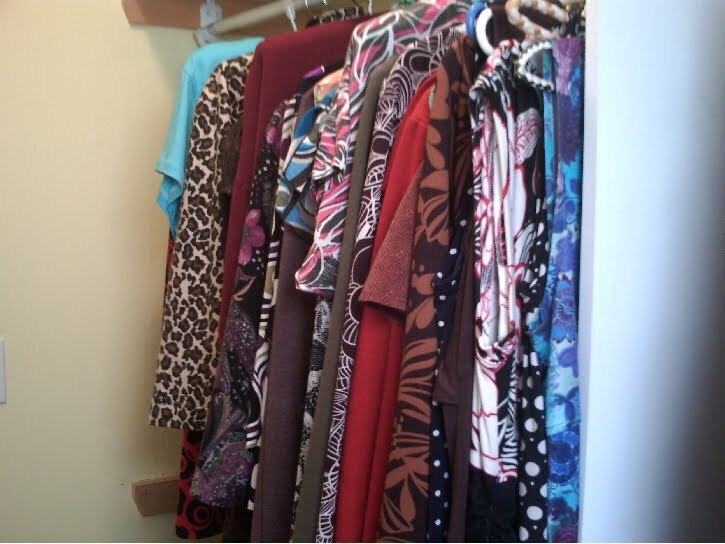 I, Anne Maskell,(or, as I'm know on WR, Tigermomma442) pledge to abstain from the purchase of "new" manufactured items of clothing , for the period of 2 months. I pledge that I shall refashion, renovate, recycle preloved items for myself with my own hands in fabric, yarn, or other medium for the duration of my contract. I pledge that I will share the love and post a photo of my refashioned,renovated,recycled,crafted or or created item of clothing on the wardrobe refashion blog so that others may enjoy the joy that thy thiriftiness brings! Today was kind of a mish-mash day. The weather was miserable, rainy and overcast until dinner time. (naturally) Does anyone else find that moody grey days just aren't the best days to get anything done? I had to go out this morning with my friend, and of course we ended up at goodwill. I didn't buy anything today though. Once in a while I can find a few things at reasonable prices, but those days are few and far between anymore. Goodwill used to be the 'go to' store for clothing deals, but thier prices have gone up so much that it isn't always thrifty to shop there! I refuse to by a beat up old tee shirt for $4.99! Especially when I can get a new one at Walmart for $5! It doesn't make sense. (not that I WOULD buy new, I've taken the WR pledge, and I plan to stick with it! )( So far so good!) Tomorrow I plan to spend the day sewing. I made one cardigan the other day, and I have another one cut out in another fabric. It is from Simplicity #2424. 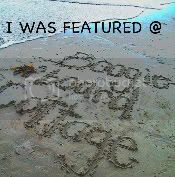 I have to apoligise for the quality of the photo's. My poor camera isn't good with close ups! You can see a better pic here. 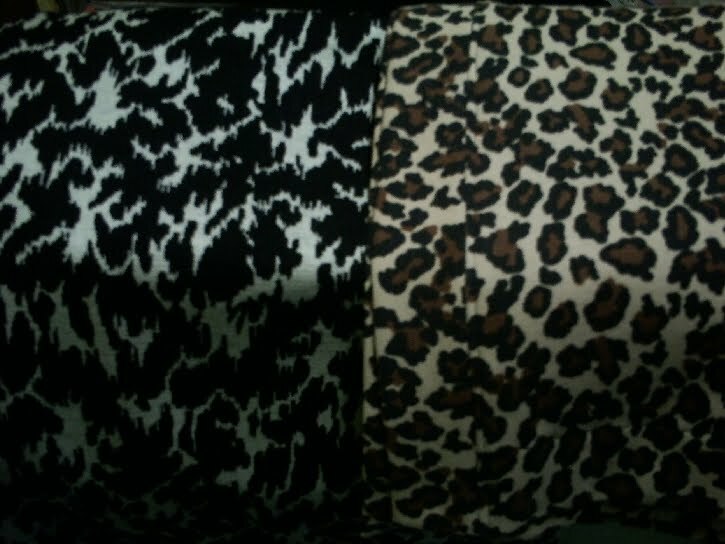 And these are my fabrics. Nice soft jersey knits. The cardigan works up really fast and easy. 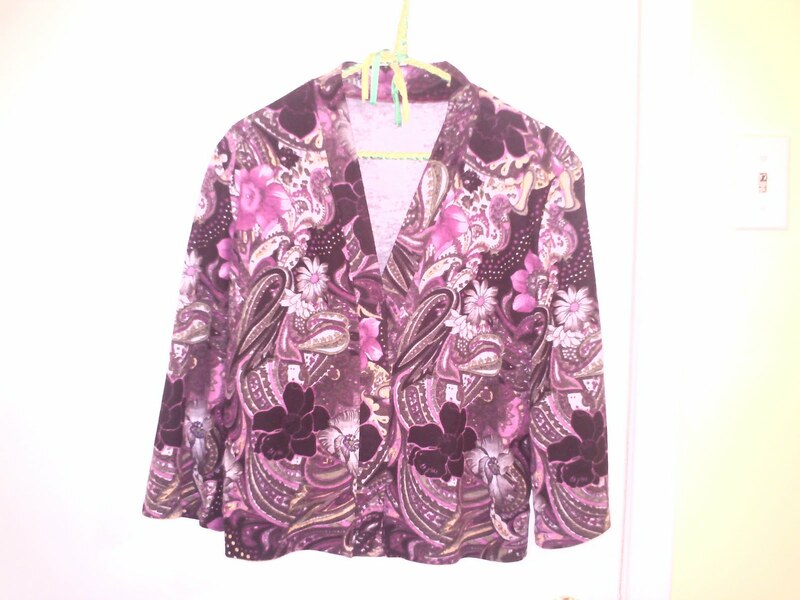 Actually, it is the same as the purple floral one I posted a few days ago. I also really like the jacket on the pattern too. Looks like it would make a nice fall jacket. I'm sure I have something in my stash to make it out of! He came home from school with this. 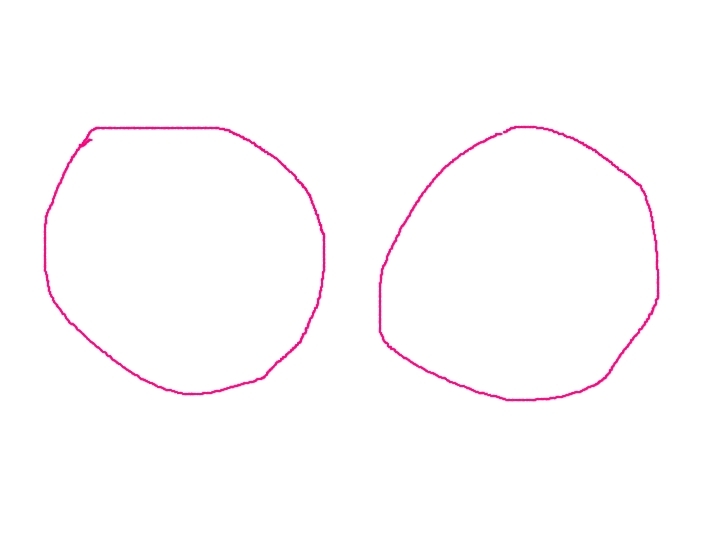 A large piece of paper with two big holes cut out. - a piece of paper with holes in it! IT'S A JOB APPLICATION FOR HOOTERS!!!!! where do they GET this stuff! Well, as I said yesterday, dinner was fab. My step-mom out did herself- again! Ham, scalloped potatoes and lots of side dishes. Then apple pie and ice cream for desert. I elected to jog home after, but didn't make it down the driveway! The gifts I made were well received by S-M(step-mom) and nieces. S-M wore her apron all day! The girls loved their dresses, and they fit very well, especially since I had no measurements to go by. It's hard to get sizes correct for small kids, they grow soo fast. 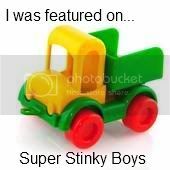 I was proud of my kids too. My daughter helped us in the kitchen, while my sons (the big He-men) played with the kids. It is so cute to see my grown sons crawling around on the floor with little kids. In my last post I talked about trying to dress nicely everyday, even if I don't go anywhere. I'm trying! 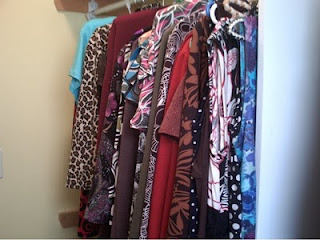 I took a couple pics of my closet, of all the clothes I have hanging in there. All of it is handmade by me. The poor things seem to go directly from my machine to the closet, never to be seen again. It is such a waste! A lot of the things I make I give to my best friend, who at this point has a better wardrobe than I do! I do have to admit that alot of the things I give her are things that turned out too small or were not a good fit. She is alot smaller than me. So.. back to my original idea. I'm going to wear ALL my clothes instead of falling back on a few favs, and of course my beloved pj bottoms! I'm sure my family will be happy to see the change! I thought I'd also show you my secret addiction. I LOVE costume jewelery! I have a special space in my closet just for that! 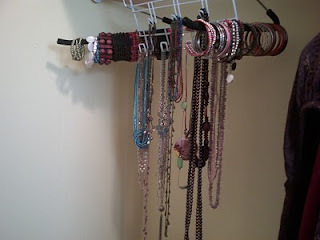 These are just some of my necklaces and bracelets. I also have some in a basket in my room, waiting to be hung up. Costume jewelery is soo much fun! You can find so many different things, all at reasonable prices! I have to admit that I have picked up a few items at the dollar store, mostly wooden and beaded items. And I've been complimented on them! People are surprised when I tell them where I got them! Since I'm trying to be fashionable on a tight budget, I can get 3-4 items for less than the cost of one at any large dept store. I am also going to try making some things for myself. I found a tute at 'hand made by carolyn', for a knotted rope necklace . LOVE IT! !I have some aqua rope that I plan to use. If you haven't already, you should check out her blog here. She does some amazing work. I'm thinking of a matching bracelet.... 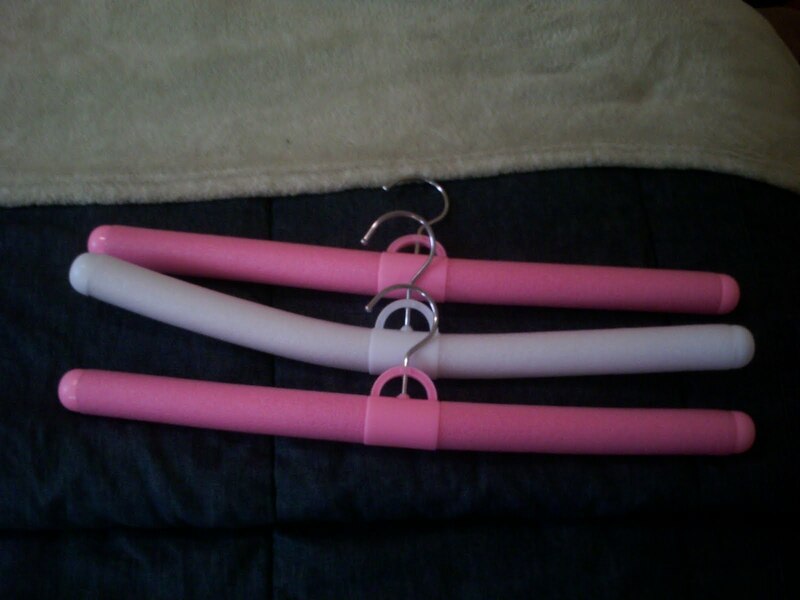 The last thing I'm going to tell you about today are my new hangers! I think these things are great. They are 3 for $1.99 at JYSK. They are a straight wire hanger covered in foam. They can be bent up or down to suit your clothing. The best part is nothing falls off. The foam seems to grip the fabric. So no more piles of slippery clothing on the floor! Which reminds me. I have piles of laundry to do, so I guess I should get to it. Have a great day everyone! Hello out there! Happy Easter! My family and I are going to my parents place for dinner today,along with my brother and his family. With all of us,(6) and my bro's wife and kids, there will be 11 of us in total. My nieces and nephew are all under 5, so it will be a busy time! My step-mom is a born entertainer. Her cooking and baking is to die for, and these occasions are greatly anticipated. She works sooo hard on the meal and its presentation, that I wanted to do something nice for her for a change. I toyed with a few ideas, and came up with this apron. I bought the fabric in the drapery dept at Fabricland the other day. It is just a basic rectangle shape that I hemmed on three sides and added a waistband. I made the ties extra long, as I like to be able to tie them in front. I think she will like it. 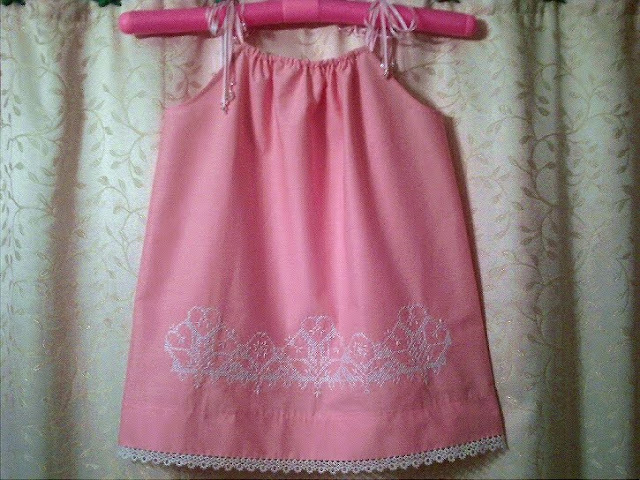 Then, because I think every little girl should have a new dress(or two!) 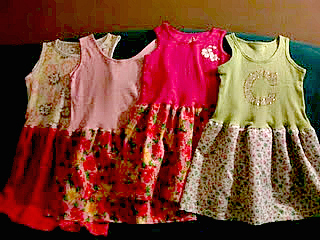 at Easter, I refashioned four little tank tops into sun dresses for my nieces. Unfortunately the flash on my camera didn't go off, and I've already wrapped the dresses, so I can't get a better pic. (Hey! 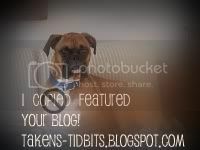 I just figured out how to move the pics around on the page!!!) They are all in nice bright cheery colours for summer. Pinks,oranges, red and green. I'm quite pleased with them. The one on the end is perfect, because the niece I'm giving it to is named Ceara (KEE R A). The C is made up of silver and gold sparkles. I couldn't believe my luck when I found it tucked away with the other tanks at Goodwill. So I hope the dresses will be a big hit. They were easy to make, just a long rectangle sewn into a tube, hemmed, and sewn to a tank that I had shortened. I didn't really need to gather the skirt part because the knit of the top stretches to fit the bottom. I did put some gathering stitches in though, so that the top wasn't stretched too much. I then serged the inside waist seam and pressed and sewed it down toward the skirt. I think I made all of them in just under two hours. I have to say I was quite pleased with myself! 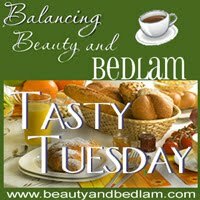 After spending a few days in bed with a major fibro flare, I thought I would try learning a few things about posting and arranging my blog. I got very busy adding gadgets and pics, and actually wrote a long post. Feeling very proud, and absolutely too confident in my abilities, I tried to add a pic to my post. Big mistake! It came out positioned in the wrong place, sticking out like a sore thumb. Of course I found this out when I looked at the preview page. Now, I can't get back to the right page to edit it! Grrrr! So here I go, starting over, hoping for better luck this time. Anyway... I mentioned that I joined Wardrobe Refashion in my last post. One of the requirements of the contract is that I copy the pledge. Here it is. I Anne Maskell, ( or tigermomma442 as I am known on WR) pledge to abstain from the purchase of 'new' manufactured items of clothing for the period of 2 months.I pledge that I shall refashion,renovate,recycle preloved items for myself with my own hands in fabric,yarn, or other medium, for the duration of the contract. I pledge that I will share the love and post a photo of my refashioned, renovated, recycled crafted or created item of clothing on the Wardrobe Refashion blog, so that others my share the joy that thy thriftiness brings! Ok. I think I give up. 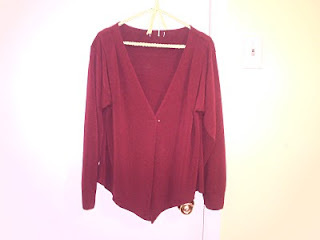 As you can see, the pic of my poor, sad, refashioned sweater appeared at the top of this post! What am I doing wrong? Help!!!!! Well, anyway, looking at the pic of this sweater, it does look rather sad and forlorn. It is actually nice in person. It started out life as a large men's polo type sweater, with a zipper instead of buttons. I cut off the collar and angled down around the zipper to give it a vee neck look. Then just cut it straight down the middle. To get the points at the bottom, I cut the back off higher from side seam to side seam, then from each side at the front, I angled the cut down to a point. I also put two pleats on each shoulder to bring it up to where it should be. Then I just hemmed the whole thing. It turned out to be very soft and comfy. I've already worn it a few times, and it washes up great. From there I went on to make two tops, and two nightgowns. I also made this cardigan. 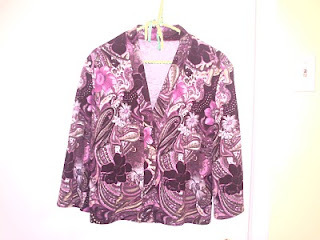 The purple and fuchsia colours don't show up well in the pic, but the fabric is beautiful. Ok, did it again. I really have to figure this out! My next projects are a couple of little dresses for my nieces. I picked up a few little tank tops at goodwill yesterday, and I plan to attach skirts to them. Hopefully by the time I have them done I'll also figure out how to insert a pic properly! Until next time, Happy Sewing!